Thursday night Colorado Fabrics had an exclusive after-hours event to debut the fabrics they acquired from designer workrooms on a recent trip to New York. I couldn’t believe how much fabric they added to the store! There were new racks up front full of bolts, bolts piled up on tables, and half the cutting tables were sacrificed for more bolts of fabrics. SO MUCH FABRIC. And all of it from the workrooms of big name designers (whose names I don’t think I’m supposed to mention). My favorite were the two racks of silks, shown above. There were lots of gorgeous prints and weaves. Everywhere in the store I found rare fabrics that you just don’t see much of. 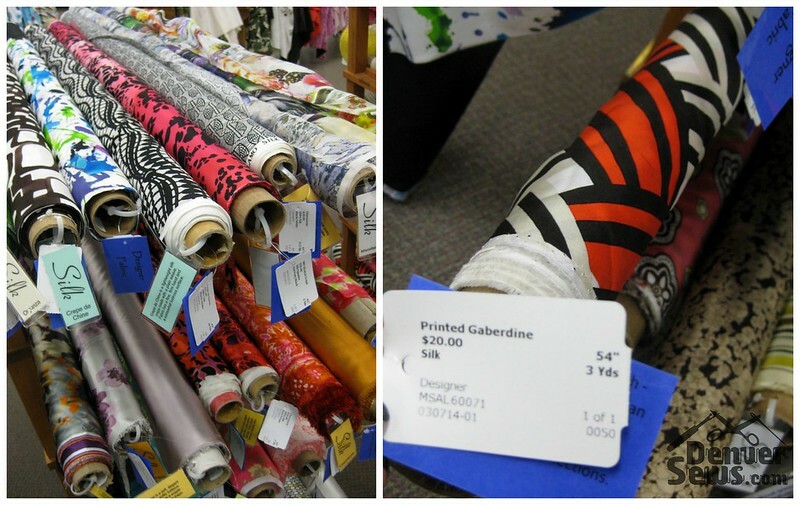 To the right is a “silk gaberdine” – I’ve heard of wool gaberdine, but never silk! Some of the fabrics had lots of yardage on the bolt, and some only had a few yards. They said if it was fabulous they bought it, regardless of the yardage. TWO tables full of coating and suiting fabrics. There were lots of luscious wools and even some 100% cashmere. Below on the left is a rack of European designer handbag fabrics (some of them appeared to be backed with a nice interfacing already) and to the right is a huge rack of scarf panels. There was a whole rack of laces including this stretch polyester/rayon/spandex blend that felt like a ponte knit. (I bought some, I’ve never seen anything like it and it was fantastic.) And a few furs – the one below is black with a silver coating that didn’t photograph too well but looked awesome in person. 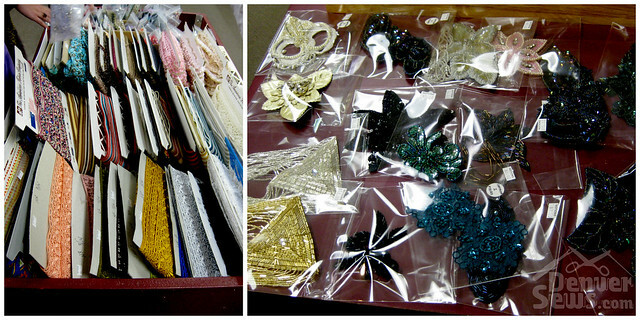 There was also a table of designer trims and appliques. What did I get? Well, I told you I’m a sucker for the silks… Left is a wavy stripe silk crepe de chine that I think will be a Grainline Scout Tee. The always fabulous Randie who was working the cutting table I was at pointed out that the background is actually a blush color “which is what makes it look so expensive”, and complimented me on my excellent fabric picks. I like Randie! Did I mention I’m susceptible to flattery? Middle is a purple stretch silk charmeuse. I love the colors, and the print kind of reminds me of geodes. 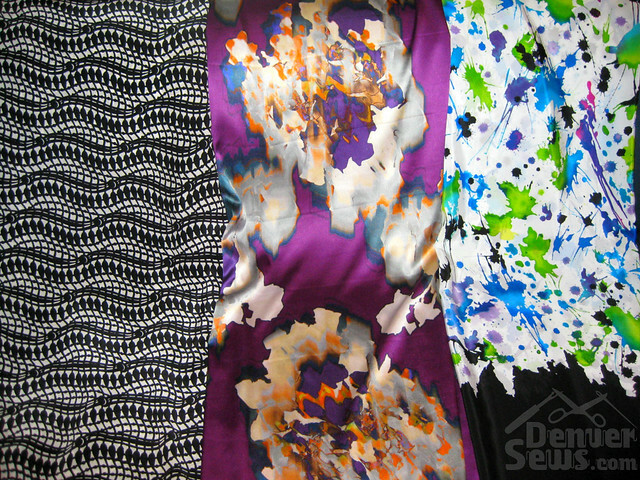 On the right is another silk crepe de chine with a splatter print and a black border. Okay, there is more… I’m a fabric glutton. Left is a wool blend boucle that is more of a fuschia color but it didn’t photograph well. I’m planning to make it into a jacket with faux leather sleeves. 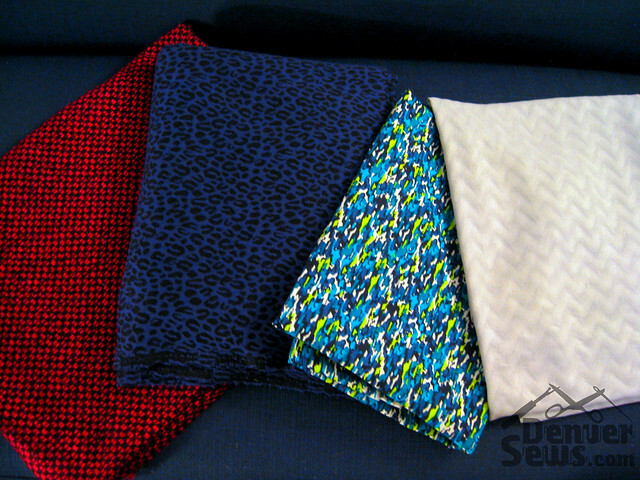 The leopard print is a double knit with a textured weave so that the black parts are recessed and the blue is raised. It’s also a nice thickness, so I think it’s perfect for a body hugging sheath dress. The blue/lime/black/white print is a stretch cotton, and finally on the right is a gauzy polyester with a zig zag (or chevron, if you prefer that term) novelty weave. Looks like I’ve got a lot to sew up. 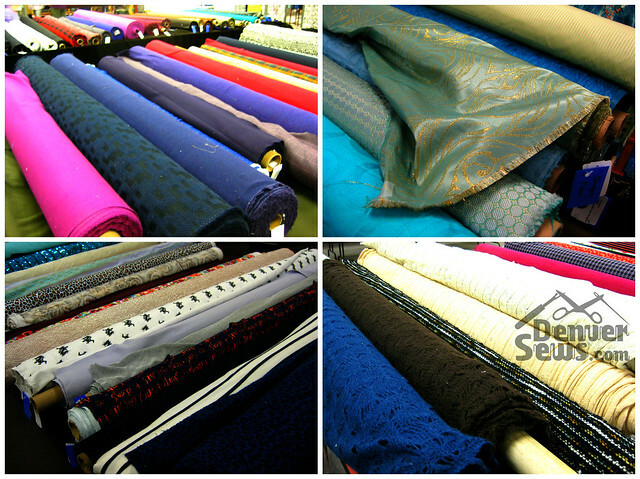 The New York designer fabrics go on sale to the public TODAY (Friday, March 14th) when Colorado Fabrics opens at 9am. If you’re interested I recommend going soon because, as much fabric as there is, I’m guessing it’s going to sell fast. 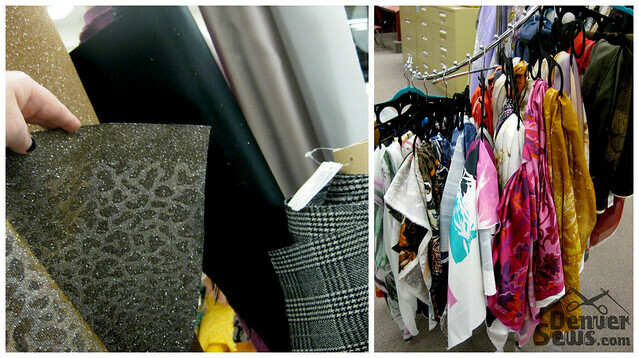 Pricewise I saw everything from $8/yard cottons and knits up to $60/yard italian silks and cashmere coating. Many of the silks I looked at were $15/yard, and I think the fantastic lace I got was maybe $12-$14/yard. 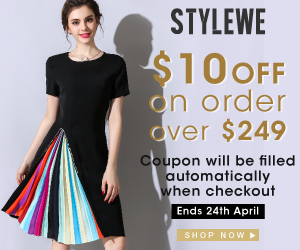 I thought it was all reasonably priced, especially compared to certain websites that sell these kind of designer fabrics from NY. And here you can touch it first. Or, hey, just go check it out to touch everything! It was a FABULOUS evening! I left with “only” one bag of beautiful fabrics, but only because I exercised amazing restraint! I’m very excited about the new resources now available to Denver garment designers and constructors. I’m hoping that they will continue to add more and more beautiful fabrics to their stock. It was a FABULOUS evening and I’m so glad I went. I “only” got one bag of fabric but that was because I exercised marvelous restraint. It wasn’t easy to choose – there were so many beautiful pieces. I’m very excited to see how this continues to grow, and gives Denver garment designers and manufacturers a wonderful resource for QUALITY fabrics. I love the silk fabrics, they look soft and luscious, a dream to wear. I love reading your blogs, thank you for sharing. Looks like some gorgeous fabrics. I might have to actually make a trip down there to look. I was thinking about you when I saw those purse fabrics! Oh Jamie! This post was a bad influence on me. I went the Colorado Fabrics today and left with TWO.HUGE.BAGS. of fabric. I thought shopping with friends was bad, actually it’s gorgeous fabrics that do me in. Thanks for the motivation. The fabrics you’ve shown are beautiful. Thanks for the info! I love your fabric choices too. Colorado Fabrics really reminds me of a much cleaner and larger version of Vogue Fabrics in Evanston, IL. Same sources for fabrics, etc. Looks super fun! I can’t wait to see what you make with your new purchases!